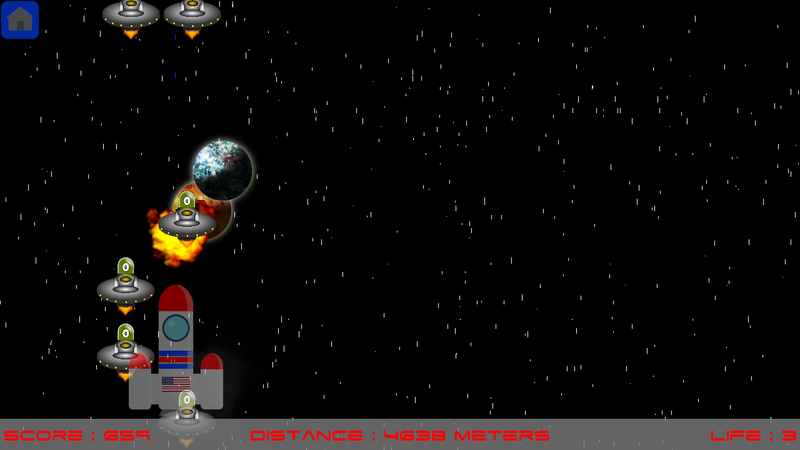 Today I would presenting you a game I'm currently working on since some days : SpaceRace. - I don't like to argue about intendation (besides using two spaces instead of tabs) but you could be a bit more consistent. Most code ist aligned, but some ifs aren't which kinda "pokes me in the eye"
- you use quite a lot of global variables which in most languages is considered bad practice. I think at least the menu*-music ones could be dropped. As far as I understood it you use them to play the sample infinetly as long as the menu is open. You should look into Song.play(true) which play the song in a loop forever. I found one "bug" so far -> you require './animation.rb' but the file is called Animation.rb which is no problem on Windows but nearly every other OS where filenames are Case-sensitive. After renaming it worked fine. Performance - I think I noticed some delays every few seconds but haven't looked deeper into it. Might do that this evening if I got some spare minutes. You can look at https://github.com/bbatsov/ruby-style-guide if you want although that are only guidelines (there are quite a few I personally don't agree). But if you're new to ruby you could fetch quite some nice tricks and syntactic sugar from it. Otherwise good job. Yeti Runner a few weeks later SpaceRace - you seem to enjoy it. Some more in your pipeline? "I don't like to argue about intendation (besides using two spaces instead of tabs) but you could be a bit more consistent. Most code ist aligned, but some ifs aren't which kinda "pokes me in the eye" " -> The indentation appear well in my code editor (Eclipse with Ruby extension), I think it's because of it ! "use require_relative 'animation' over require './animation.rb' " -> why ? "you use quite a lot of global variables which in most languages is considered bad practice. I think at least the menu*-music ones could be dropped. As far as I understood it you use them to play the sample infinetly as long as the menu is open. You should look into Song.play(true) which play the song in a loop forever." -> Yup, but it's about only 6 global variables, still, l'ill try to make it better. For the music, yeah l'ill see about it. "I personally would also move some files in subdirectories like all states to states/ and the rest to lib/" -> Not sure of doing it, I like this, but still better. Thank you for the ressources, for reading and playings ! Yeah I know that's possible, everything is possible in programming (especially with Ruby) ! Still, I'm using some global variables because it make simpler to use a same objects (such as a Channel) inside the program. So that's why I done in this way. - Can I win somehow or just run for the Highest Score? - When I collect boosters sometimes I get the fancy Overlay (I especially like the swirl!!!) but sometimes not. I guess its because I am still in the "boosted" state but its not exactly clear when the booster is over. Maybe you could do some visual to show that I'm back to normal? e.g. Add "fire" to your rockets jetpack if its boosted. - The Score is a bit confusing. Distance traveled - totally clear. "Game Score: 298 Meters"? What does that mean? - Maybe move the text in the buttons just a bit to the right. It looks a bit cramped. - Change the booster visuals. The red cross reminds me of "get health/life" instead of fly fast as hell. - Add a +1 Life booster or maybe as a reward for some "milestones" like get +1 every 10.000m traveled. - Make the shield you get with the superbooster a bit more visible. Took me a bit to actually notice the small white line around the ship. maybe change the color and add a bit of distance between shield and ship. Back to the coding-style-suggestions - Its totally fine if you follow your own style within your own code, but if you at some point in the future might want to contribute to the ruby community or maybe work at a game with someone else following the community style is helpful ;-) And there is no need to actually change the code in your running game. I used quite some global variables in my game(approaches) too or just have a couple ow files "all over the place" but at some point it became inconvenient and I looked for alternatives. Now when I start from scratch I have developed some best practices for my personal workflow. So I guess just go on and maybe in your next games try to do some things differently. So and thats a perfect transition to the unanswered but most important question ;-) => any other games planned? "When I collect boosters sometimes I get the fancy Overlay (I especially like the swirl!!!) but sometimes not. I guess its because I am still in the "boosted" state but its not exactly clear when the booster is over. Maybe you could do some visual to show that I'm back to normal?" -> When it's not, it's as you said : you still in "boosted" state, but yeah I agree on the fact that not exactly clear that booster is hover. Maybe I could stop them from comming when we are in boosted state ? "e.g. Add "fire" to your rockets jetpack if its boosted." -> Good idea ! "The Score is a bit confusing. Distance traveled - totally clear. "Game Score: 298 Meters"? What does that mean?" -> Oh... That's an error I've done.... It should be points, sorry :( L'ill fix it soon. "Change the booster visuals. The red cross reminds me of "get health/life" instead of fly fast as hell." -> It's right, but I would something that represent the two, because (now in the version I'm working on) the booster give a bit of life, but I would it boost and give you life, but not idea for something the represent the two things. "or maybe as a reward for some "milestones" like get +1 every 10.000m traveled." -> Not a bad idea, still I need to found a reward. But life is enough huh ? "Make the shield you get with the superbooster a bit more visible. Took me a bit to actually notice the small white line around the ship. maybe change the color and add a bit of distance between shield and ship." -> Yeah, I saw the same things to myself, but a was a bit lazy.... Or maybe make the shield (transparent) on the spaceship ? But be sure, l'ill fix it this time ! "PS: My best distance travelled so far ~ 40.000m" -> Great !! :o Doesn't reached this distance by myself xD ! Wow it looks really cool ! I also love low poly graphics (PS: your photo remind me Equilinox, from ThinMatrix), it looks really simple but beautiful ! Hey, just would to say you the new version is released on itch.io and Github !